All Star Music is a fun resort set to its very own beat. There are five themed areas of the resort including: Calypso, The Broadway Hotel, Country Fair, Jazz Inn and Rock Inn. Each section is adorned with large icons representing the genre of music that is highlighted. All Star Music is home to not only standard resort rooms, but family suites as well. These suites can sleep up to 6 guests and offer an affordable option for a larger group. This and Art of Animation are the only Value Resorts that offer family suites. Dining: All Star Music offer 3 meals per day at the Intermission Food Court. Pizza delivery is also available to guest rooms. Transportation: Transportation is available by bus to all four theme parks, both water parks and the Down Town Disney area. 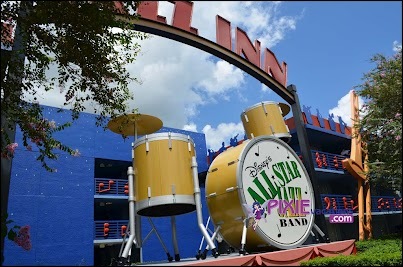 Quick Review: All Star Music is a great choice for larger families who are looking to get all the perks of staying on Disney property without a huge price tag. It is a fun resort that kids will enjoy. If you are looking to get more out of your vacation than just touring th parks you may want to opt for a moderate or deluxe resort. This entry was posted in Resort Spotlight, Value Resorts and tagged All Star Music, Family Suits, Intermission Food Court, Pizza Delivery. Bookmark the permalink. The Contemporary Tower is a very nice hotel. The monorail, of coruse, glides right through the Grand Canyon Concourse (did you notice the goat with five legs in the mural? )Memorial Day weekend is a busy one, but if you’re staying on property and especially at the Contemp Tower, you’ll have a blast. You can walk to the Magic Kingdom, and its an easy monorail ride to TTC where you can get transfers to the other parks.Hope you have a great trip.